Are you stressed out, fatigued, or just plain exhausted Well now there is a supplement available that can provide you with a natural drug free alternative to caffeine, refined sugars, or stimulants. Try Max Energy™ if you are looking for an energy boost. Our proprietary blend of safe, natural energizers will support stamina and help maintain energy throughout the day. Bee Pollen supports energy, endurance, and has more available amino acids than beef. It’s a core constituent of any energy formula being super rich in enzymes, vitamins, and minerals. Octacosanol is an alcohol naturally stored in the muscles. It supports athletic erformance, the capacity for exercise and physical activity. Chlorella is highly digestible green algae. It contains the complete vitamin B complex, vitamin C and D, a broad spectrum of minerals, and essential fatty acids. It improves the energy level in the body and supports mental focus. Eleuthero Powder is Siberian ginseng. It supports stress reducing hormones in the body. 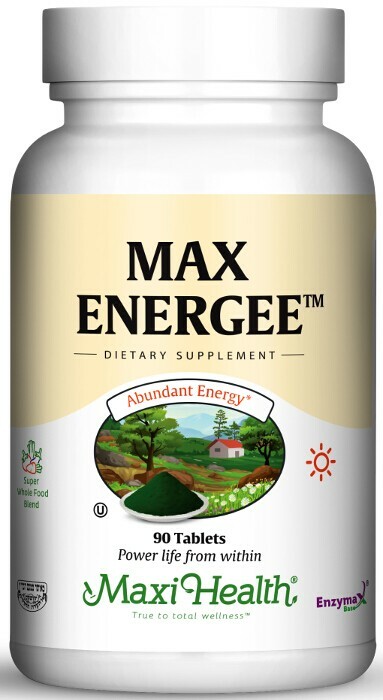 Get to the top of the game with Max Energee™! Take two (2) tablets daily, one tablet with breakfast and one tablet with lunch, or as directed. This product contains no animal products, wheat, gluten, yeast, soy, sugar, salt, milk, artificial flavors, colorings or preservatives. Enzymax®, a vital digestive enzyme complex, is a registered trademark of Maxi Health Research® LLC. • PolicosanolPlus® is a registered trademark of Innovation Laboratories, Inc.